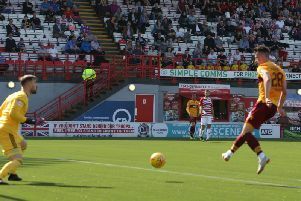 Louis Moult’s excellent performance against Partick Thistle came after two weeks of intensive training led by Motherwell assistant gaffer James McFadden. Moult netted in the 2-0 triumph as part of a fine overall performance and manager Mark McGhee outlined his delight when addressing pressmen directly after the match. “Over the last two weeks Louis Moult has worked extra every day with Faddy,” McGhee said. “He’s been running, getting fitter, getting back his strength and really getting at it. “It paid off today because he looked fitter than he’s been, he looked sharper, hungrier and more aggressive than he’s been and he was a big part of how we played today. McGhee praised Moult’s “brilliant” link-up play with strike partner Scott McDonald, emphasising that he’d been telling the pair to work closer together on the park. The only blot on fellow scorer McDonald’s copybook came when he passed up a good shooting opportunity in the second half in favour of trying to pass to Chris Cadden. “He (McDonald) looked as if he was running down a staircase,” McGhee said. ’Well adopted a 3-5-2 formation to match up with Thistle. “We changed our shape because we’re not great at improvising,” McGhee said. “When we come up against the likes of Inverness when they play a different shape we find it difficult and Thistle have been doing well with their 3-5-2 so I felt we had to match it. “And then ask the players the question all over the park, win their individual battles and we did. “We worked really hard from the back to the front. “The young boys coming in, Fergie and McMillan did ever so well and needed to play their part.